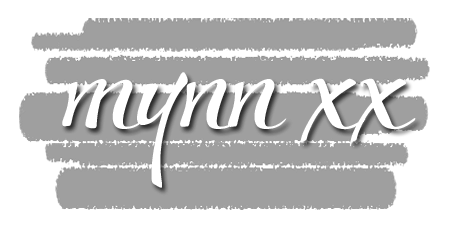 September 1 New Reveal Blog Hop! 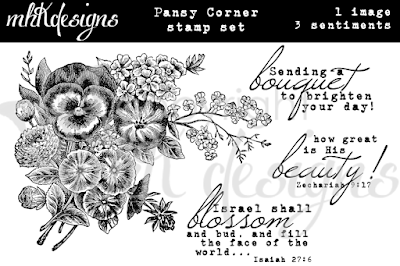 We have four new rubber stamp sets to share with you today and one new digi-only stamp set. These new sets are 20% off until the 3rd of the month. 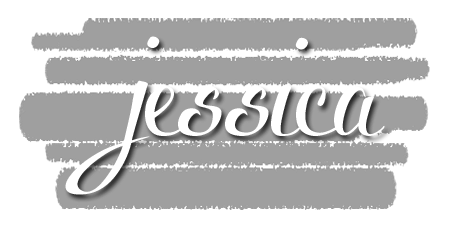 So once you finish the blog hop, head on over to the store and start shopping. All of the new sets are available on cling mounted rubber or as a digital image. 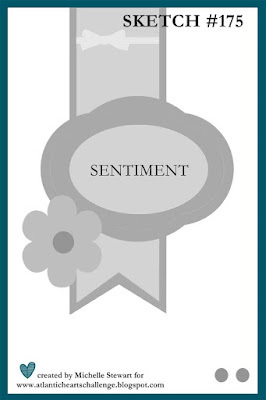 On Sept 3rd, ONE GRAND PRIZE WINNER will be selected from the comments left on the Designers' blogs listed below. Please leave a comment with each Designer in order to be eligible for the Grand Prize. You never know who the Mystery Designer will be that has the winning comment. 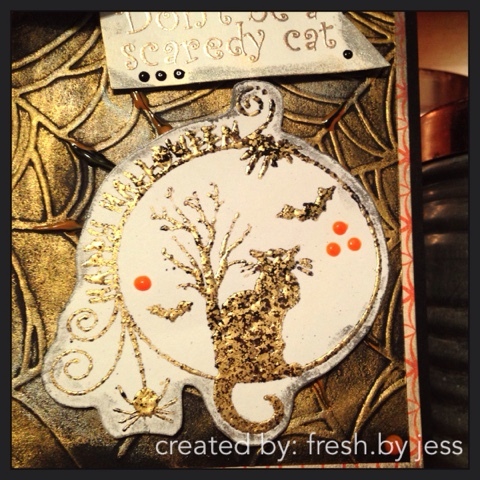 So I just fell in LOVE with the "Halloween Cat" stamp set! 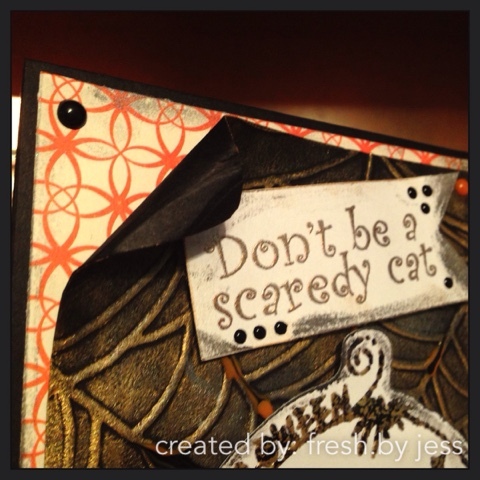 First, I ran a piece of black cardstock through my BigShot using a spider web embossing folder. Then I used my finger tool and rubbed Black Ash & Indian Gold Embellishment Mousse over the embossed panel, creating the fun background. I stamped the large cat image onto a piece of white cardstock using Versamark Ink and sprinkled on Fleur de Lis Embossing Powder, heat setting from underneath. Then I fussy cut out the image. I rubbed on some of the Black Ash Embellishment Mousse around the edges. 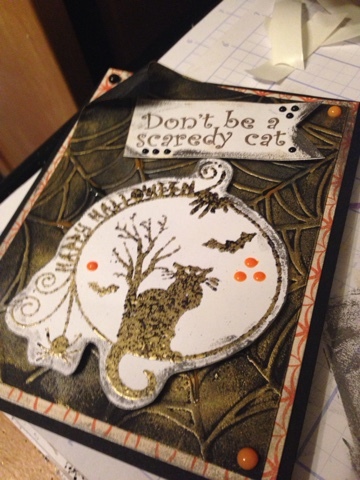 The sentiment was stamped with Versamark Ink and I used Antiquities embossing powder to accent it. Black Ash Mousse was also rubbed on the edges. 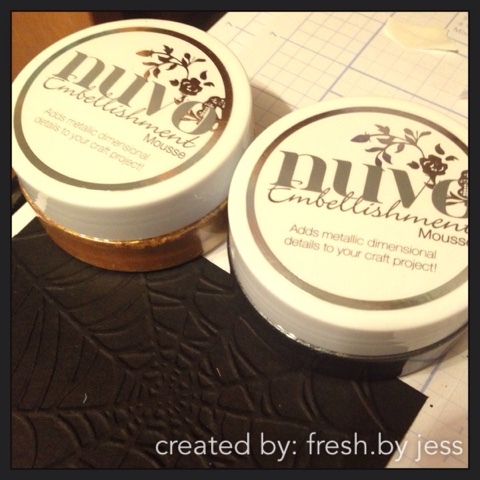 I made some fun accents using the Ebony Black and Ripened Pumpkin Nuvo Crystal Drops. All of the layers were adhered using 1/2" Tear-ific Tape and I popped up the image/sentiment using Foam Squares. I'm so glad you stopped by the blog hop! 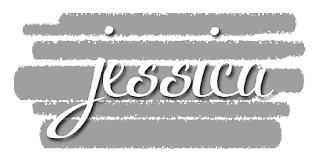 I'm the last stop, so if you are just starting here, you can restart from the beginning on Eret's blog. Be sure to leave some designer love - we love to hear your comments! 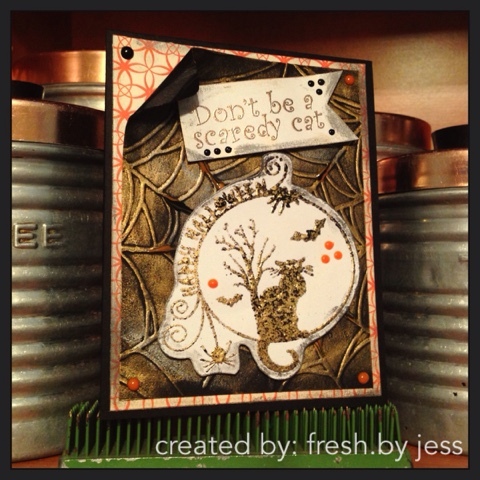 This card was created using Simon Says Stamp August card kit :) Don't you love the scratch off circles? How cute!! 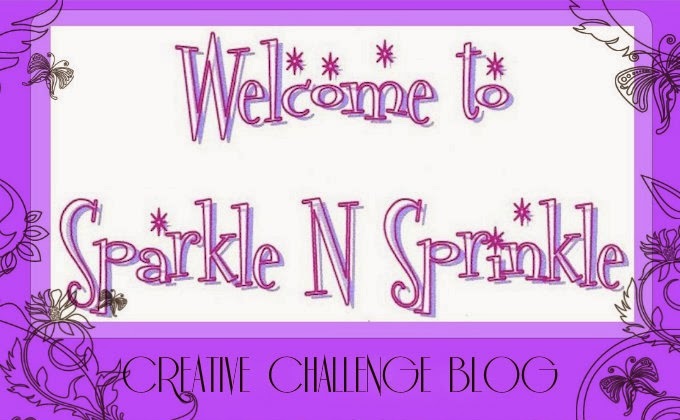 I'm back today with a new card for SparkleNSprinkle. 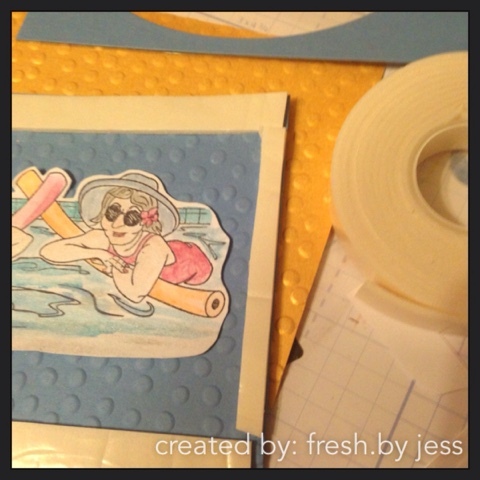 This time, I used the new release stamp set called "Pool Friends" to create a fun shaker card! Let's go! 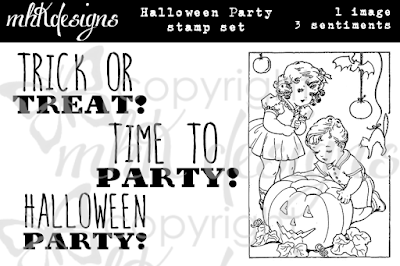 Stamp image onto white cardstock using Memento Ink and color. 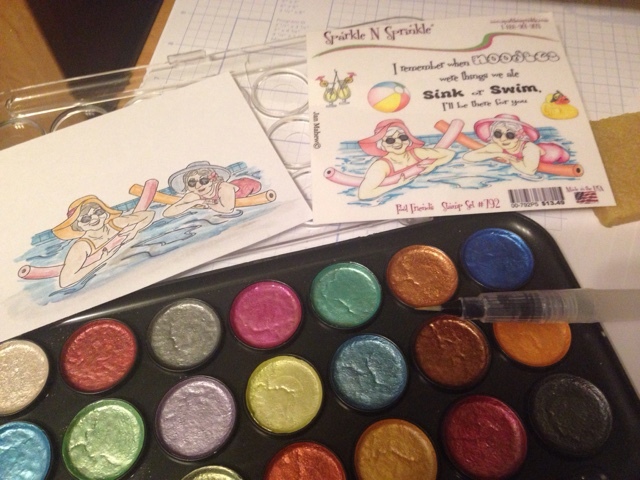 I used our Pearlescent Watercolors and an aquabrush to paint mine. Create your "window". To start, I took a 4x5.25 piece of blue cardstock and used an embossing folder to add some dimension. I took a second piece of the same sized blue cardstock and cut out the window using an oval die & my Big Shot machine. I cut a piece of Embossable Acetate to 4X5.25. The colored image was centered where I wanted it to show through and adhered using 1/4" Tearific Tape to the background piece. Next, I attached my Embossable Acetate to the underside of the "window" piece using 1/4" Tearific tape. I added the Foam roll all around the very outside edge of the base (I cut the roll in half to make it skinnier so it wouldn't "peek" into my window. I added my sequins and then attached the top panel carefully so the Foam Roll wouldn't show through. So far, so good! 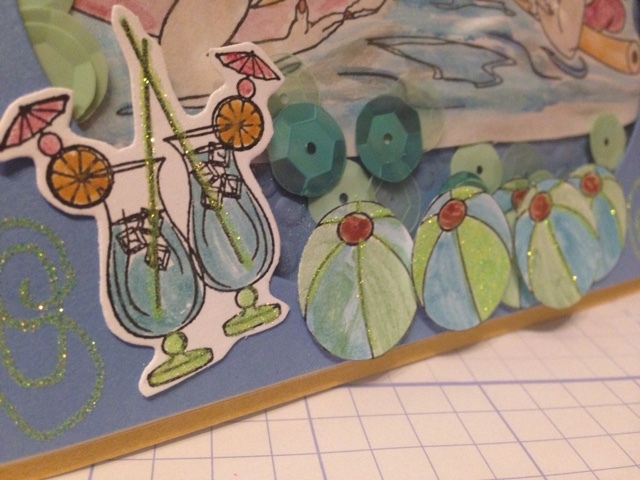 I stamped out 5 beach balls using Memento Ink, watercolored and fussy cut them out. To add more sparkle, I took my Quicky Glue Pen and added some Margarita Glitter to some of the beach balls. 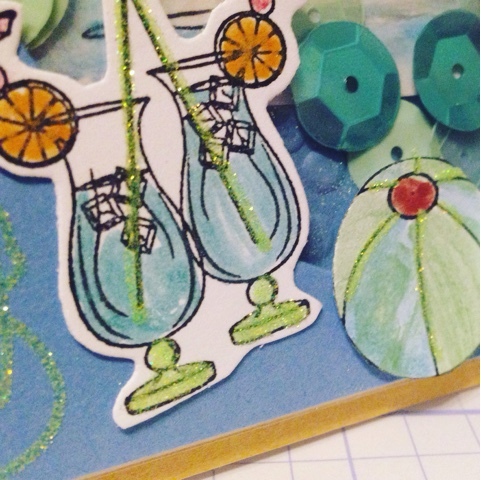 I stamped out the drinks & sentiment and followed the same procedure (watercolor, Margarita Glitter and trim). I adhered the sentiment and some of the beachballs using Foam Squares (adds dimension!) and the rest was adhered using Tear-ific Tape. I also added a piece of pull ribbon to the sentiment using a mini stapler. I didn't pull it, just cut a small piece and formed a small loop. Finally, I doodled around the outside edge using my Quicky Glue Pen and sprinkled on Margarita Glitter. The entire "shaker" was then adhered to a piece of 4.25X5.5 Zeus Gold Carstock using 1/2" Tearific Tape. See how simple a shaker card can be? I hope you enjoy this card and pick up some of the supplies I used to create it from the shop. 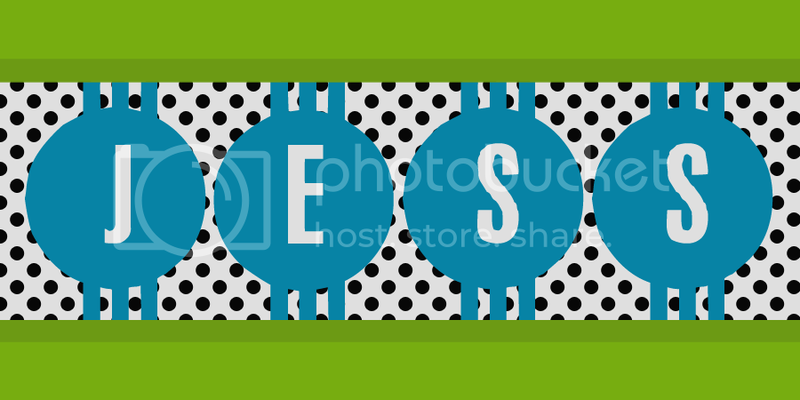 I'm here today to share my Monthly Inspiration for you for MHKDesigns! I made this step up card featuring the Going Gingham Pastels Digital Paper! I printed off the sunflowers from a set called "Blossoming". The butterflies came from 2 different sets - Beginnings & Endings and Butterfly Wisdom. The sentiment came from "Eat Your Cake". I just love being able to pull elements together from multiple sets to make a card! 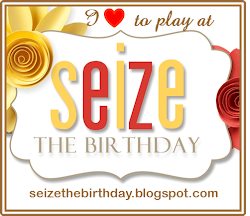 I'm also entering this card over at "Seize the Birthday". 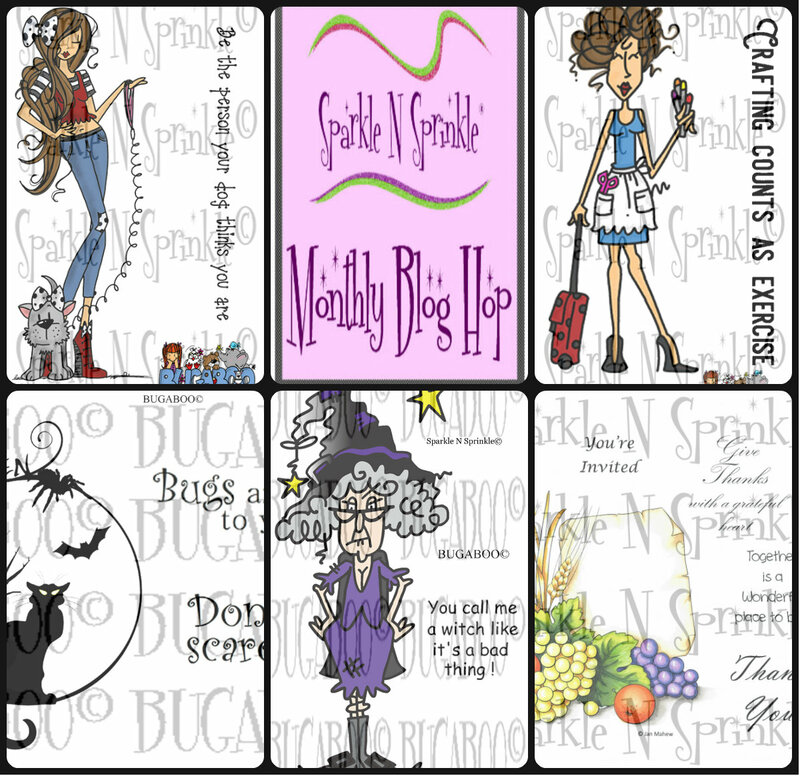 It's time for another Monthly Challenge at MHKDesigns! First, I printed off the Digital Stamp onto white cardstock. Next, I took my TwinTouch markers and slightly colored in the wings. Then, I used Ken Oliver & Nuance Watercolor Powders to watercolor the entire panel. The sentiment was printed off onto vellum paper and adhered with Glue Dots. I hope you enjoy this card and be sure to join us in our monthly challenge! Thanks for stopping by today, friends! I had so much fun with this release. Don't forget to get all your commenting in for your chance to WIN, and please do join our monthly challenge, as well! Thanks for joining us for release week! I'm here today to share a new card that I created using the New Release Stamp set from SparkleNSprinkle called "Flower Cart". 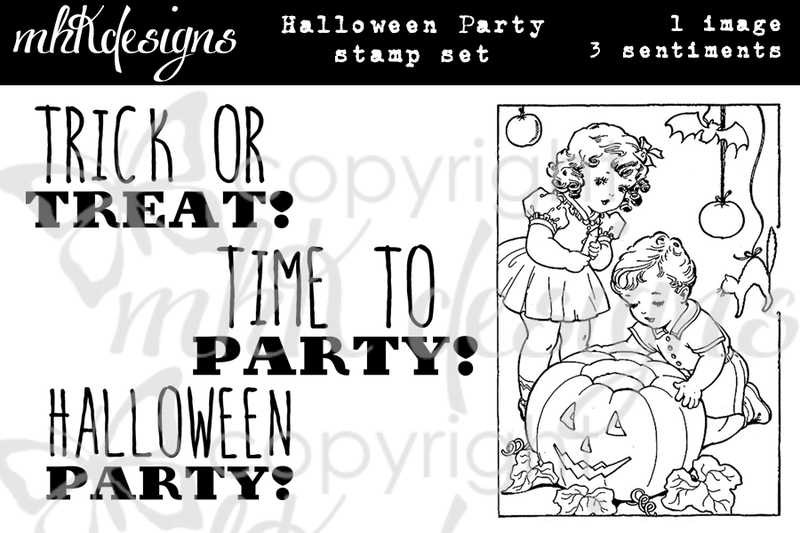 This stamp set is so versatile & fun! Let's go! I die cut the image out using my oval dies & Big Shot Machine, then applied Peony Pink Nuvo Embellishment Mousse around the edges of the image using my finger tool. The sentiment was fussy cut out and then all I did was trace the words using my Quicky Glue Pen, sprinkled on Princess Rose Embossing Powder and heat set. I cut a piece of 4x5.25" purple cardstock. I then inked up an embossing folder with Versamark Ink and ran the paper through my Big Shot. What this does is create and embossed AND inked surface! 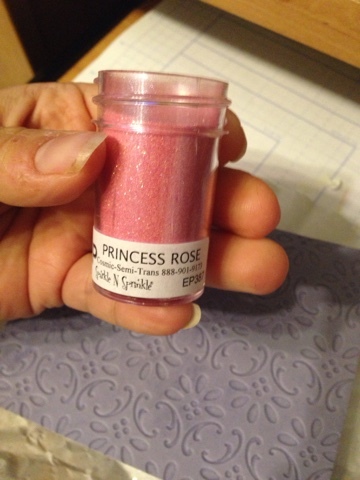 All I did next was sprinkle on my Princess Rose Embossing Powder to the inked surface and heat set, creating a gorgeous, sparkly, embossed background piece. 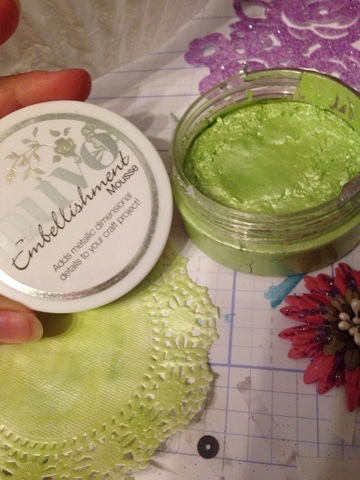 I took a white doily and completely covered it using Spring Green Embellishement Mousse. I just used my finger tool to burnish it in. I just LOVE how shiny and fun the mousse is to work with! You've gotta try it! Step 3 - Let's Put it Together! I adhered my doily to the background using Brushable Glue, then added my main image using 1/4" Tearific Tape. The sentiment was popped up using Foam Squares. 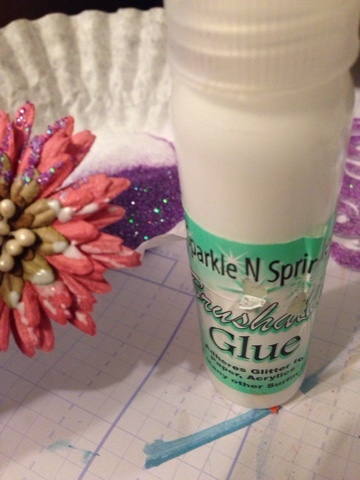 I took the main flower and added some random smears of Brushable Glue, then sprinkled on Fairytale Lavender Glitter for some sparkle. I set it aside to dry. I made some "Candy Dots" using the Crushed Grape Nuvo Crystal drops on the background and also in the middle of another flower. I also set this aside to dry (I let it sit overnight). Once everything was good and dry, I adhered the flowers with Foam Squares & Tear-ific Tape. The entire card front was then mounted using 1/2" Tear-ific Tape onto card base that I made from purple cardstock. VOILA! 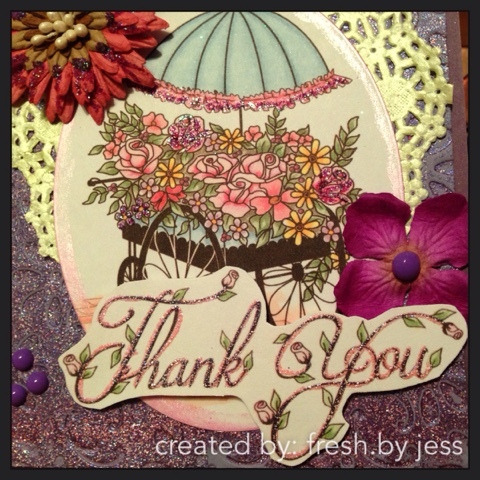 A gorgeous Flower Cart Thank You card! I hope you enjoyed this card. See ya next time! Thanks for stopping by today, friends! We will be back tomorrow with inspirational projects that use products from the MHKDesigns Etsy shop! Don't forget to get all your commenting in for your chance to WIN, and please do join our monthly challenge, as well! A new one starts tomorrow, and we can't wait to see what you create! See you tomorrow! 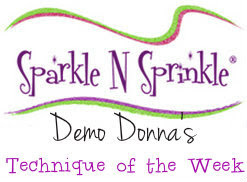 SparkleNSprinkle - Flower Cart Creations!